Seasoned simply with salt and pepper, it is straightforward and uncomplicated and goes well with a variety of cuisines. Eat it hot or eat it cold, either in long stalks or chopped. If your feeling fancy, you can easily jazz it up with a variety of seasonings. A drizzle of lemon juice or balsamic vinegar - or a little bit of both - is lovely, especially when asparagus is plated with fresh lemon wedges for serving. You could drizzle with a bit of infused olive oil, such as lemon, garlic, or Italian herb. What about a sprinkle of fresh herbs, like tarragon or dill? Or, for a different direction, dry sprinkling with a bit of orange juice, ground coriander, and chili flakes or aleppo pepper. 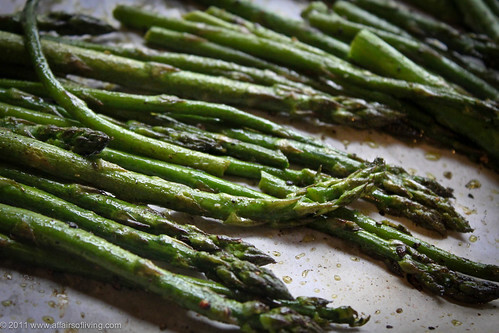 Someday, I want roast asparagus in a wood-fired oven. Last weekend I helped build a cob oven at a friends' home. A cob oven, if you aren't familiar, is a natural oven made of clay, sand, straw, firebrick, and insulation materials like sawdust and glass bottles. These outdoor ovens are fired with wood and reach temperatures of 700º. They are perfect for baking bread, pizzas, vegetables, meats, and just about anything else you can imagine. Building it was a blast and I can't wait until I have the chance to help build more! What a good skill to learn. I'm even more excited to actually use my friends' oven, all I've been thinking of is the glory of crispy GF pizza cooked in a wood-fired oven. If you have a wood-fired oven, give this recipe a shot. I anticipate it will take less time and yield really lovely results. optional seasonings: lemon juice, orange juice, balsamic vinegar, fresh herbs (dill, tarragon), infused olive oils or vinegars, ground cumin or coriander, cayenne pepper, chili flakes, or anything else your heart desires! Heat the oven to 450º F. Line a 9"x13" baking sheet with parchment or lightly coat with olive oil and set aside. Wash asparagus and pat dry. Trim off the woody ends from the asparagus stalks. Place stalks on the prepared baking sheet and drizzle with olive oil and toss to lightly coat. Then sprinkle with salt and pepper. Place in the oven on the lowest rack and roast for 10-15 minutes, turning half way through, until stalks are tender and tips start to get a little bit crunchy. Remove from oven. While the flavor is rich and wonderful as is, the cooked asparagus can easily be jazzed up for a different flavor experience. once removing it from the oven, you can choose a variety of seasonings. 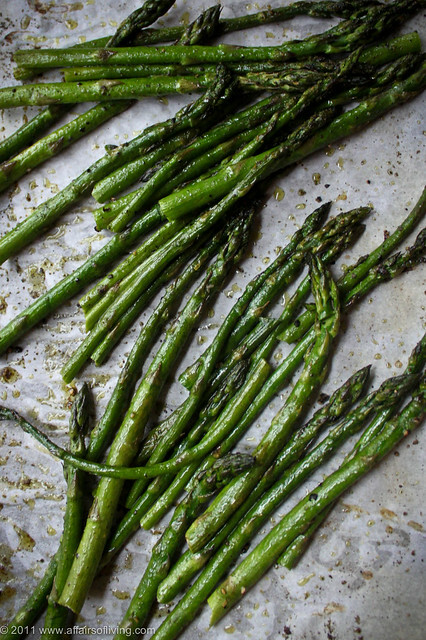 A drizzle of lemon juice or balsamic vinegar - or a little bit of both - is lovely, especially when asparagus is plated with fresh lemon wedges for serving. You could drizzle with a bit of infused olive oil, such as lemon, garlic, or Italian herb. What about a sprinkle of fresh herbs, like tarragon or dill? Or, for a different direction, dry sprinkling with a bit of orange juice, ground coriander, and chili flakes or aleppo pepper. Eat hot as is for a simple and delicious vegetable side dish, or diced and added to pilafs or risotto. If you prefer to eat them cold, the roasted asparagus stalks can be chilled for use in cold grain salads, vegetable plates and green salads (excellent with baby green and salmon, capers, eggs, and roasted red peppers). Try dipping a chilled one in a bit of garlicky homemade aioli - yum.